Mind The Rant: Turn on YouTube’s Speech-to-Text Closed Captions ... They’re Hilarious! Turn on YouTube’s Speech-to-Text Closed Captions ... They’re Hilarious! 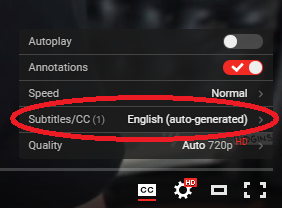 The other day I discovered that YouTube has introduced automated, possibly on-the-fly closed captioning for a lot of its videos. I don’t mean to make fun of Sean — it’s obviously not his fault YouTube has attached some nutty closed captions to his video. But unfortunately for the guy Google’s speech-to-text algorithms seem to have a tough time figuring out what the hell he’s saying. Fun fact to know and tell: according to Google Translate, murni is the Indonesian word for pure. Of course, my guess is that Google has deliberately introduced this “feature” in beta (or, if their dev team is being honest with themselves, in alpha). As they did with Google Maps in 2005, the Googleplexers figured they’d publish the tool early and gradually, inexorably work out the kinks. Until that day arrives, though, turn it on, tune it in, and watch those priceless captions drop out.